Advice Home > Dementia > The Pathophysiology Of Dementia: What Causes It? 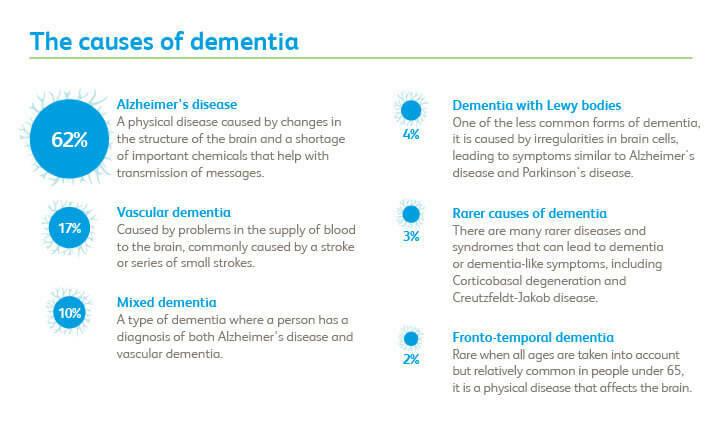 Dementia is a symptom of many different possible conditions and not a disease in its own right. There are several ways it can materialize, and each illness has varying ways that can affect the body physiologically. This process is known as the pathophysiology and its goal is to explain the changes that happen in the body when a disease is present. This article will outline the pathophysiology of dementia from some of the most common ailments that lead to it and provide general treatment advice for the condition. As previously mentioned in the introduction, multiple diseases and events can bring about the onset of dementia. However, in general, degradation of cells in the brain, whether it is through biological or external means, is the specific reason for it. Some biological reasons for diseases that cause dementia are infections, like Creutzfeldt-Jakob disease, and the narrowing and damaging of blood vessels in the brain, perhaps from a stroke, which can cause vascular dementia. Genetic factors can also play a critical part in the formation of these diseases, such as with Huntington's disease and possibly Alzheimer's. External factors can refer to repeated head injuries and concussions which are responsible for chronic traumatic encephalopathy (CTE) and dementia pugilistica. Sports that involve extreme physical contact are associated with these injuries. Alcohol abuse is another non-biological source of brain degradation. Despite having various roots, these diseases all have one thing in common - they damage the brain which causes dementia and its many symptoms involving mood, behavior and cognitive impairment. Even though they have similarities, the mechanisms by which each of these ailments destroys brain cells do vary. Perhaps the most well-known perpetrators of dementia, this disease is often associated with older people and senility. It is the dominant cause of it in people over the age of 60 years old; it affects at least 12 million people around the globe . The causation of Alzheimer's disease is not entirely understood just yet, but the research over the years has provided us with some clues to its origins. It is believed to be activated by a mix of genetic and environmental factors. Lifestyle choices are also speculated to play a role in its onset. Plaques in the brain, caused by the accumulation of the protein beta-amyloid, along with neurofibrillary tangles are associated with all cases of Alzheimer's. The amyloid structures produce adverse effects in the brain and cause cell death. In cases like this where proteins become abnormal, it is known as proteopathy. In this disease, cell death is connected with the build-up of proteins in the brain, known as Lewy bodies. These tend to gather in the basal ganglia, the substantia nigra, as well as the thalamus and the cortex, which causes a reduction in dopamine. Dopamine is a neurotransmitter that has several critical roles in the body, such as motor control. Strokes are a prominent cause of disability around the world, due to its profound impacts on the brain. If the stroke is not fatal, it can instigate permanent brain damage. A stroke can be defined as an event where inadequate blood flow is provided to the brain - this causes cell death. This lack of blood supply is precisely the pathophysiology of vascular dementia. Dementia in stroke patients is created by the reduced blood supply from blocked vessels, which leads to progressive cognitive impairment. This event can also happen in minor strokes. The brain has an intricate system of vessels to provide blood and oxygen to it; however, it is also fragile. Chronic traumatic encephalopathy is a term that refers to repeated head injuries that lead to brain degeneration. 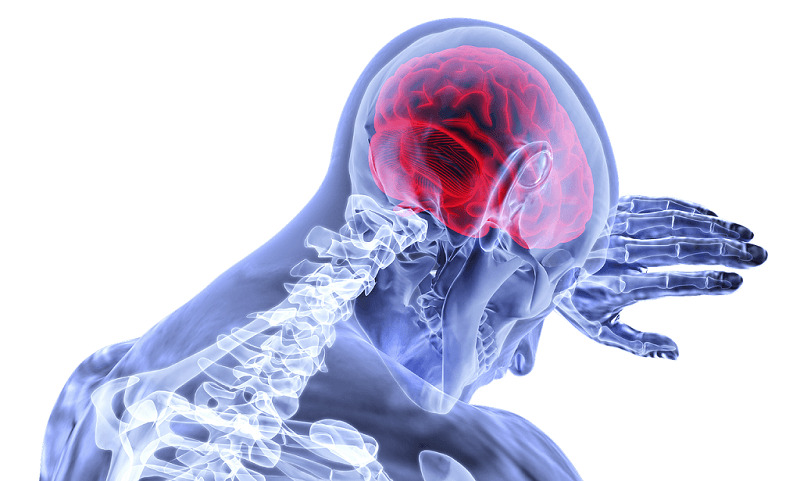 It is most common in athletes who can be prone to concussions during their sports, such as boxing and American football. However, CTE has also been discovered in military veterans. The dementia associated with CTE is known as dementia pugilistica. Pugilistica is derived from the word pugilist, which can refer to a prizefighter, like a boxer. The pathophysiology in CTE involves Tau proteins which clump in the brain, can make tangles, often around the sulcal depths . Chronic traumatic encephalopathy can potentially appear very early in one's life, or it can happen many years later. This contrasts with other conditions where dementia usually does not start showing signs until old age. Also, unlike other diseases, CTE cannot be formally diagnosed until a patient is deceased. This condition is the merger of two separate diseases - Wernicke's encephalopathy and Korsakoff syndrome. Wernicke's involves movement pattern and coordination issues, and Korsakoff's symptoms can include memory loss, personality changes, and hallucinations. Wernicke-Korsakoff Syndrome (WKS) is caused by a thiamine (vitamin B-1) deficiency. This issue can arise from malnutrition and alcoholism. The pathophysiology of this condition involves sugar and energy. If there is not enough thiamine, the brain cells do not have adequate fuel to perform tasks . In contrast to other diseases in this list, WKS is treatable if caught early enough, through thiamine supplementation, and people can make a full recovery. Alcohol abstinence is required to prevent the dementia symptoms from progressing over time. Alcohol impacts the body's ability to absorb and use thiamine, especially in the brain. Chronic alcohol abuse can shrink brain cells, and it is also toxic to other parts of the body as well, namely the liver and heart. Except for Wernicke-Korsakoff syndrome, dementia and its associated diseases are incurable and cannot be reversed. Treatment cannot address the pathophysiology of dementia diseases in the brain; however, they can treat the symptoms of it. Acetylcholinesterase inhibitor drugs, like rivastigmine, donepezil, and galantamine, are given to increase acetylcholine levels, a neurotransmitter that is associated with cognitive function. Similarly, memantine can be prescribed alongside acetylcholinesterase inhibitors; instead of escalating levels, it reduces glutamate levels in the brain. It is believed that excess glutamate can damage brain cells. Additional medication can be supplied to address mood and behavioral illnesses that are comorbid with dementia. These conditions can include depression, anxiety, and psychosis. In these cases, antidepressants, anxiolytics, and antipsychotics can provide relief. While not a direct treatment, making a home dementia-friendly is essential. Doing this involves making the living space safe and organized. Furniture, loose rugs, and other obstructions should be moved to prevent accidents. Frequently used items should be labeled and easy to access. Some therapeutic activities that do not involve medication are exercise and playing games and puzzles. These can help improve the patient's mood and keep the brain active. Social interaction during these activities is encouraged as well. A proper diagnosis from a doctor is required to receive medication. This prerequisite excludes chronic traumatic encephalopathy, which relies on symptoms because it currently cannot be diagnosed until one's death. However, regardless of the diagnosis, medication options are typically the same. A physician will also be able to provide information regarding dosages and side-effects. 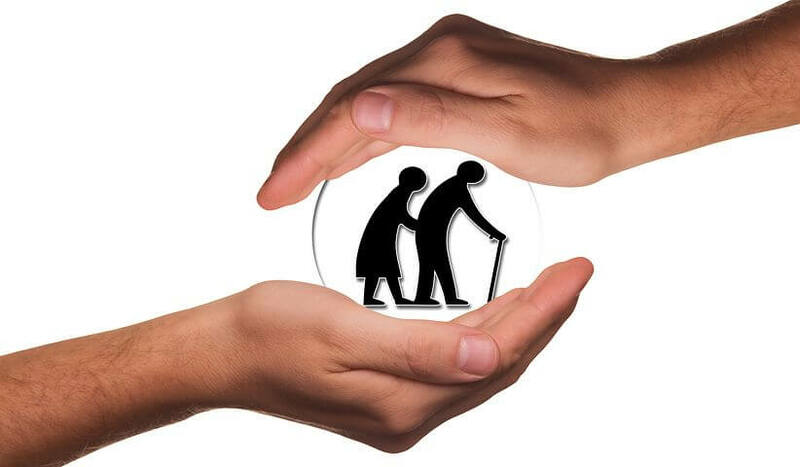 For advice regarding home modifications and other non-drug therapies, licensed counselors and therapists can be found at BetterHelp.com, who can help answer any questions you might have about how you can assist a loved one with dementia. Many diseases can cause dementia, and likewise, the pathophysiology can differ between them, even slightly. Some of the most common origins of dementia-causing diseases are a result of proteopathy, where proteins become abnormal and disrupt brain functions. Examples of proteopathic diseases are Alzheimer's, Parkinson's, and chronic traumatic encephalopathy (CTE). Unlike the other two, CTE manifests from head injuries in sports, such as concussions. These events lead to the formation of Tau protein structures in the brain. It is entirely preventable, whereas Alzheimer's and Parkinson's may have a genetic component to them. Other conditions that are specific in their origins are vascular dementia and Wernicke-Korsakoff syndrome (WKS), which can be caused by strokes and thiamine deficiencies, respectively. The pathophysiology of vascular dementia is defined by blocked vessels and a lack of blood flow to the brain. For WKS, a lack of thiamine is often due to alcohol abuse, but it can also be from malnutrition. The pathophysiology of dementia is about as diverse as the several different diseases that can cause it. It is a complex umbrella symptom that is difficult to manage for all parties involved. By joining us at BetterHelp.com/signup, caregivers can have access to the support that they need. A reliable network is crucial for addressing the concerns of friends and family members as well as for providing the best care for the patient.